As its title suggests, “Annihilation” is a decidedly bleak film. Unlike what one would expect, it’s also not exactly a pure apocalyptic fantasy. Those expecting a Michael Bay-style (’86) film in which a group of scientists save the world by blowing stuff up will leave disappointed. 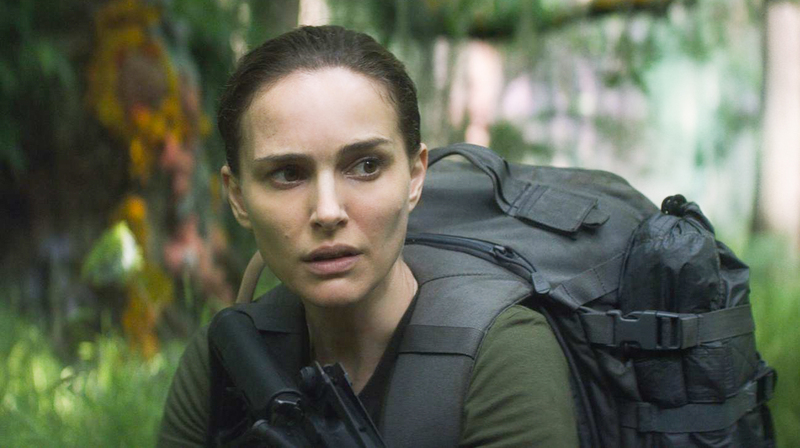 Instead, “Annihilation” boasts more depth than many of its science fiction counterparts. Its subject and setting are not an excuse for explosions and expensive special effects, but rather a means for exploring what it means to be human while using a fantastical and imagined world. With its atmospheric setting and cerebral plot-driving mechanisms, “Annihilation” is one of the smartest and most startling films in recent memory. After a year of waiting, Lena (Natalie Portman) is surprised when her husband Kane (Oscar Isaac) suddenly returns home from a mysterious military mission. But he is not his usual self: His memory of the past year is missing, he speaks in short and odd sentences, and he seems to have no emotional attachment to his wife. The reason behind his behavior soon becomes clear—a year ago, he was sent into a place known as “the Shimmer,” a strange area in which the normal laws of science no longer seem to apply. This place, also known as “Area X,” has been consistently expanding in size and risks consuming entire cities. Several military teams had been sent the Shimmer, to investigate the nature of its existence, but Kane is the first person to ever return. In an attempt to save her husband, Lena (herself a biologist and former Army soldier) joins a group of female scientists and ventures into Area X to understand how it works and how to destroy it. Written and directed by Alex Garland (of “Ex Machina” fame), “Annihilation” is both beautiful and startling to watch. The Shimmer is absolutely gorgeous to look at: Located in Florida marshland, there’s an eerie mix of natural greenery and decidedly more unnatural images. There are branches taking the form of human beings, actual trees that look as though they’re made of glass, and more. Amid this eccentric beauty is a series of nightmarish monsters. They first emerge as normal animals, but within the Shimmer they quickly evolve to take on more frightening forms. A blend of natural and unnatural is a common visual motif within Garland’s film, and it is one that’s astounding to behold. But there are also subtler touches to his direction. He manages to make his most simplistic scenes disorienting and discomforting. He cuts between shots of characters at very different angles. A simple conversation between two people may begin with a close-up of one of them sitting down, then switch to a profile shot of another standing up. These cinematographic details may sound unimportant, but they’re an understated, disorienting transition from two very different perspectives. Little touches like these are present throughout the film, unnerving the viewer without them realizing it. The film is not merely well directed, though. Portman leads a solid cast, featuring Jennifer Jason Leigh, Tessa Thompson, and Gina Rodriguez. Leigh and Rodriguez are the standouts of the cast. The former plays the creepily distant Dr. Ventress, a psychologist who always seems to have ulterior motives. Rodriguez, on the other hand, gives a more energetic and blatantly intense performance. The rest of the cast, however, is let down by a script that never really gives them a chance to shine. This leads me to my major gripe with “Annihilation”: for all its interest in human nature, it’s shockingly disinterested in its characters. Garland strangely takes a distanced, emotionally detached approach to his characters. We find out little about them and what motivates them to go on a suicide mission. When we do learn about the characters’ motivations, Garland presents them to the audience in the most matter-of-fact way possible. We gain no insight into the inner workings of these scientists, only a brief statement describing why they do what they do. However, where Garland’s script shines is in his exploration of the film’s larger themes. The Shimmer is not merely a plot device but a reflection of human nature. As it copies our DNA and evolves other living beings in sync with it, the true horrors of Area X are the horrors already present in nature and ourselves. They may have taken on an unusual form, but their origin is far more conventional. This idea reaches its zenith in the film’s startling final minutes. As with the best films, the ending uses visual imagery to perfectly explain its central idea. I won’t spoil the ending here (it must be seen to be truly appreciated), but it’s a daring and experimental attempt to express the worst aspects of human nature with science fiction concepts. There’s a strange figure, a cavern straight out of “Alien,” and a surprising, deeply ambiguous final twist. In the film’s last moments, the self-destructive nature of humanity is on full display. If that sounds like a dreary finale, it’s because it is—like much of the film. “Annihilation” is not your comforting, standard movie fare. If you’re looking for fun, hopeful science fiction, watch “Star Wars” again. But if you’re interested in a film that will challenge you and force you to think, “Annihilation” is an outstanding watch.